The forecast rain held off until the dying deaths so it wasn't too bad today. It started off quiet but turning into an acceptable day this afternoon. Down the yard, work continued on Faraday's bodywork with needle gunning and painting of frame work taking place. Further restoration work on coach 4440 also took place. A local lady came down to donate a piece of glass which she believed was from a Mk2 coach, that she had been using as a table top. Turned out it was a DMU windscreen for a "bubblecar"! A really hive of activity at Wirksworth today with many different departments all working away. Firstly, trains were running with modest numbers to start the Easter running season. The Met-Camm 3 car received a body wash, eventually, after a cracked plastic stop tap caused water leak mayhem. Down the yard, routine fuelling was done and some other shunting to prepare for the week ahead. The Duke's water tank was moved to the back of the shed so it can be worked on and the former Derby Ground Frame was removed from the car park. The Signalling Dept continued the construction of their bracket signal too. What a contrast a week makes! Last weekend during the main event we were literally freezing and poddling around in snow and this week we had decent temperatures and warm sunshine! This weekend was a running weekend for the visiting Warship-class diesel locomotive "Onslaught". This locomotive really has proved a hit with enthusiasts as they came in their hundreds to have a ride. Many even enjoyed the unusual experience of travelling on the brake van veranda right behind the locomotive as it powered up the hill. We are very grateful to the East Lancashire Railway's Bury Hydraulic Group for the loan of the locomotive. On Saturday evening, we added an extra train to the timetable as enthusiasts had asked us to operate a return trip with the Class 08 which initially came for the gala. It seems the locomotive might be with us for a while longer and so they had asked if we would consider letting them ride behind it. We were all too happy to oblige! With it being a slow locomotive and also due to current crewing for it, our only option was to do it in the dark but it didn't seem to matter. Down the yard, work continued on the various projects, including the bodywork on Faraday on Sunday, which had mostly cleaning and painting as the restoration progresses. 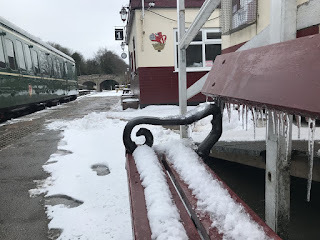 It has been a frustratingly mild week compared with the torment went through during the Diesel Gala at the weekend. This week has felt a little empty with the stress of a major event not there but we do look forward to the Warship running this weekend. We have also added, by request from enthusiasts, a return journey with 08704 leaving Wirksworth at 18:15 on Saturday evening. Down the yard, work to fit vacuum brakes to BSK 35006 continued and Met-Camm 50253 is having a replacement coolant radiator fitted after the previous one started leaking. The S&T Dept continued working on their new bracket signal for Shottle. It was our Diesel Locomotive Weekend with four locomotives operating services including the mighty Class 42 Warship D832 "Onslaught" from the East Lancashire Railway. It was also the first time an 08 had operated in the valley. Stalwart 33103 "Swordfish" rolled out of the shed with the paint still wet in a stunning new livery too. The weekend took a lot of hard work and planning from various different departments and it is a shame that the weather really let us down. We had lots of snow, especially overnight in to Sunday which at one point questioned whether the Sunday could go ahead. Fortunately it could though. I don't suppose it was as busy as it would have been if we had had normal weather but it was still good, especially on Saturday. Many enthusiasts braved the cold conditions to enjoy a day out. "Onslaught" has a running weekend next weekend for those who want to catch it! It was all about gala preparation today as the coaches were marshalled into a set for the weekend, coupled up and brake tested. A clean internally is coming up tomorrow. Down the shed, the finishing touches were being applied to the beautifully repainted Class 33. Look out for it at the weekend! These last few days have very much been about preparation for the forthcoming Diesel Locomotive Weekend. This has involved an almost frantic time completing the the SO bar car and CK so that they can run at the event as well as shunting to release other coaches. Deep in the shed, some serious hours have been put in to the repaint of the Class 33. Fortunately it is now nearing the light at the end of the tunnel and stunning it looks too! We have tried to keep publicity at bay about this to create some impact at the event. Saturday saw a shunting refreshers course take place which was most useful for some people and was made all the more exciting by having a Class 08 to do it with! Said locomotive did a useful test run to Duffield to confirm timings for the event next weekend and they discovered a divert wasn't operating. The divert may only give you 2 or 3 mph more but it makes a difference! Passenger trains ran on both days with average loadings for the time of year. A party in for Catering on Saturday boosted numbers in that department. Steam experiences got underway for the season on the incline and were greeted by excited waving neighbours in the new houses near Ravenstor. 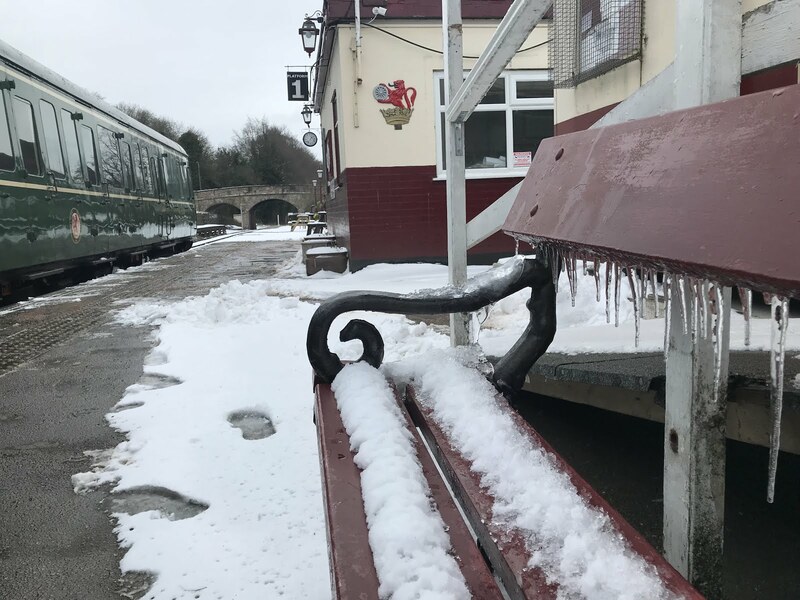 With everyone being fed up with the weather we decided to defy The Beast from the East and operate as planned at the weekend. Whilst admittedly Sunday was quiet, Saturday was more than reasonable and it was good because a pre-booked birthday party could go ahead as planned. They enjoyed a train ride and an afternoon tea in the buffet. We started out early to clear the platforms of snow and grit round and it was well worth it in the end. There was a hive of activity down the yard, with many poddling around in the snow. The Class 31 received a B exam with the owner and owners mate coming from Northamptonshire being joined by three of our own chaps. Five people crawling all over the locomotive changing all the brake blocks, checking the battery levels, generator condition, traction motors etc in order to ready it for the forthcoming gala as well as the season in general. There's also a mad dash on to ready the final two coaches for the same gala, with the SO receiving a vacuum cylinder swap in the car park on Saturday. These were piped up on Sunday. Yet again the gala was in mind as the 33 painter continued with glossing the locomotive. Hopefully the change in temperature doesn't cause the metal to sweat too much which would hamper this project at the final hurdle. It was nice to see everyone working towards a common goal. Well you wouldn't know it is March! Really cold at Wirksworth although not as much snow as expected. There hasn't been much progress this week because of the weather but today a few hardy souls went in. Platform 1 was cleared of snow in anticipation of running trains tomorrow. If conditions stay like they are or improve then we will go ahead as planned but if more snow falls we will have to reconsider. The decision will be made early in the morning as it depends on what happens tonight with the weather! The Class 33 received it's first gloss coat today and nice it looks too. No peeking mind!